I would love to know what everyone thinks the real causes are. Personally I think it’s a mixture of inequality in education and not having basic needs met with the worst food quality on the planet (by far) and a medical system that is designed to make money from you, not make you healthy. Add a sprinkle of a fear mongering media owned by a few people who make weapons for a living (or are friends with) and you have the perfect recipe for a violent society. Would we still have murdering and violence if every single person were granted good and decent education, food, shelter, water, real medicine (not pharmaceutical poisons), transportation and communication… automatically? Why would someone sell drugs for a living and be willing to kill anyone messing with their territory when everything they need is given to them automatically? We are easily rich enough, not just as a nation, but as a planet to do this without anyone who is wealthy needing to sacrifice their lifestyle or enjoyment of life… so then isn’t the real problem the belief that there isn’t enough to go around and that it’s survival of the fittest? The idea that there is more than enough for everyone and cooperation is the way rather than competition is a belief that once it dominates the psyche of the people of the world.. will finally end all of this fighting over survival needs. If you don’t believe it read “The Critical Path” by Buckminster Fuller (the guy has more US patents than anyone, even Edison). In the mid 70’s he said, “if we would only implement our current technology every person would live like they have four billion dollars. That’s $4,000,000,000. EVERY person. And that was before the iPhone or the laptop. We have the resources to end hunger, violence, poverty and war. 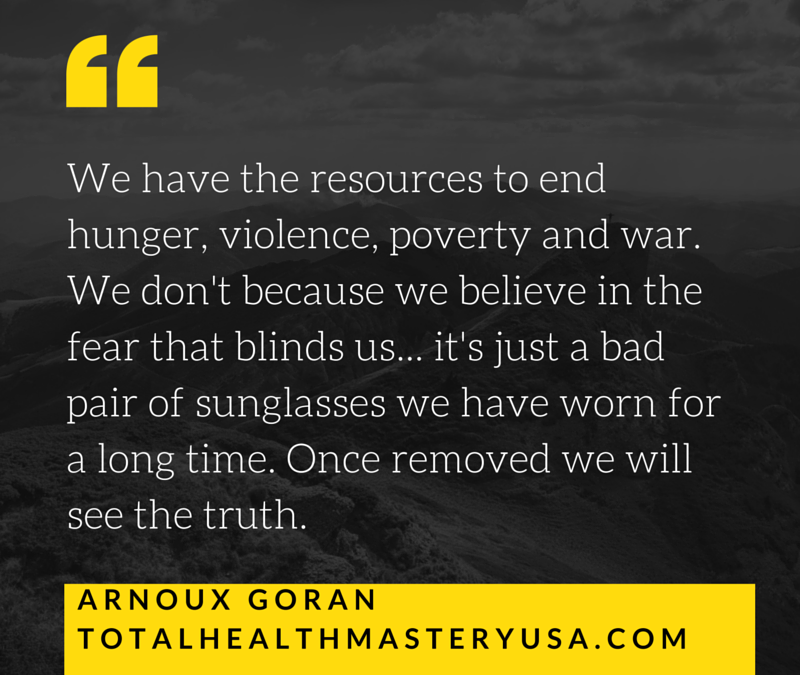 We don’t because we believe in the fear that blinds us… it’s just a bad pair of sunglasses we have worn for a long time. Once removed we will see the truth.